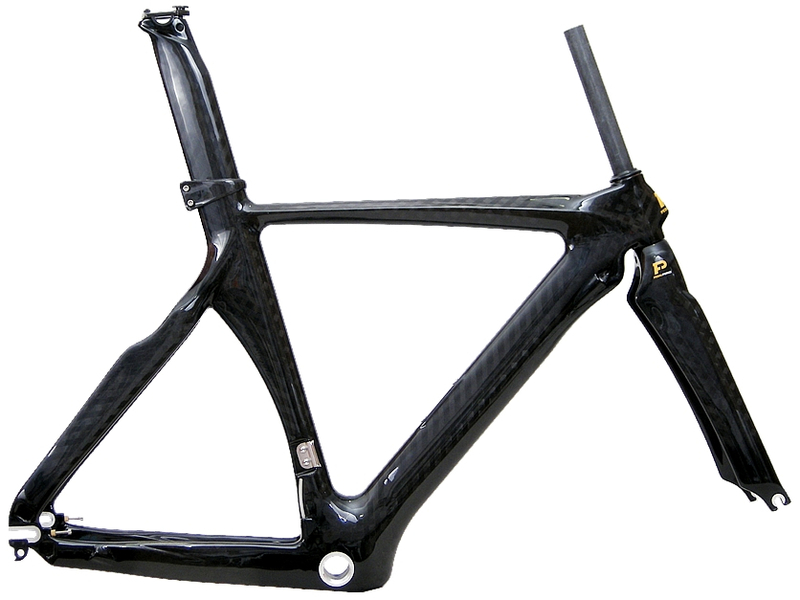 The TT2 is our high performance full carbon triathlon / time trial frameset. This air slicer is a highly optimized carbon monocoque construction with numerous features to reduce aerodynamic drag to a minimum. The streamlined profile of the fork, head tube, down tube, seat tube, seat stays and chain stays facilitates smoother air flow over the “fuselage” and reduces wind resistance. Internal cable routing ensures that there are no externally hanging cables to disturb the air flow. The seat tube's rear wheel cutout minimizes the turbulence-inducing air gap between the frame and the spinning wheel, further reducing drag. The frameset comes with a standard 75.5 degree seatpost. An optional dual-position aero seatpost is available for 76-78 degree positioning. The ultra-slim and low head tube helps you to get into an aero tuck position, while the frame's high stiffness-to-weight ratio converts every ounce of your pain into instant forward motion. We have done the engineering. Now it's your turn to do the work. Price includes frame, fork and seatpost. Full carbon monocoque fork 1-1/8".